Phil and Maria have pioneered a spiritual community in Byron Bay, called New Earth Tribe. 'The Tribe' celebrated its 12th birthday at the end of 2010. Phil and Maria are also the directors of the Deep End School; a unique Kingdom Ministry training centre that commenced in 2003. They have run seven Schools so far and over 70 wonderful students have graduated. Phil's ministry is now almost exclusively focused upon equipping the church to transition into living in the glory realms of heaven in order to attain what the Apostle Paul called "the measure of the stature of the fullness of Christ." (Ephesians 4:13) To this end Phil finds his greatest joy and fulfilment in revealing the Kingdom Ministry of Jesus and equipping the saints in releasing the glory of God through this extraordinary supernatural ministry. He has recently completed writing a book entitled Quantum Glory: The Science of Heaven Invading Earth. Phil has been married to his wife Maria for 27 years and they have four wonderful children, three of whom are now adults. They live in Byron Bay, Australia; one of the most beautiful places in the world! 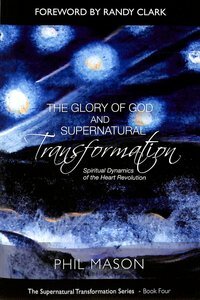 In the first instalment of a four volume series (The Supernatural Transformation Series) author Phil Mason establishes the introductory biblical principles of a radical, 'Heaven to Earth' model of the supernatural transformation of the heart. Jesus always addresses the heart because He is seeking nothing less than a profound heart revolution that plunges us into an intimate knowledge of the heart of the Father and a deepening knowledge of the human heart; to equip us to minister alongside Him to the deepest needs of the human heart. This revolutionary book invites us to join Jesus in pioneering the Heart Revolution. In this second volume of a four volume series (The Supernatural Transformation Series) author Phil Mason unpacks the biblical revelation of the new creation miracle through the lens of the gift of a brand new spirit and a brand new heart. This miracle represents the focal point of 'heaven invading earth' and it becomes the foundation of our heart journey into authentic supernatural transformation as we literally become partakers of the divine nature of Christ. This book is an invitation into a journey of discovery that is designed to activate our new core identity of sonship in order to liberate us from our old orphan heart. The Father is bringing many sons and daughters to glory!